Is Your Student Safe from the #1 Cause of Death on School Campuses? 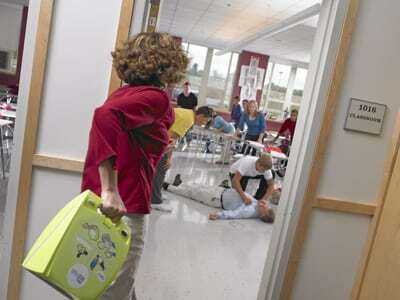 Sudden Cardiac Arrest (SCA) is the leading cause of death on school campuses. Thousands of youth are lost each year when kids suddenly and unexpectedly collapse, typically from an undetected heart condition, sometimes from a blunt blow to the chest. 92% of victims die because emergency aid is not delivered within 3-5 minutes. When the national response time for EMS averages 8 to 12 minutes, it is critical that schools be prepared to respond to a cardiac emergency. Fire extinguishers and fire drills are standard school safety practices, so it’s not hard to imagine the impact CPR, AEDs and CERPs would make in school communities. The Institute of Medicine reported that the best way to increase the survival rate for SCA victims is to engage bystanders in emergency action. A plan to do this on school campuses was recently developed by a national task force of health and safety organizations—it’s called a Cardiac Emergency Response Plan (CERP). It’s a free resource that includes a turnkey toolkit of templates schools can use to implement the CERP. What can a written and well-practiced CERP do for your school? Parents, PTAs, boosters, school nurses, PE and health teachers and other school groups can champion making their school heart safe by introducing CERPs to the principal and volunteering to be on the CER team. Find out more about making your school heart safe, and get free educational posters and flyers plus videos to share with your community.